I don't have the luxury of getting to be a stay at home mom, but I do get the luxury of getting summer's off to be with my little man. However, this is a bit of a catch 22 for us because we are very used to the routine that has been set for us throughout the year. So as soon as summer approached, I did what I do best and came up with a schedule and lesson plan for our summer together to make the most of it. I don't expect to adhere to our schedule completely everyday, but most days we do, and it works wonderfully for the two of us. We get to spend quality time together, and I finally get to teach the most important kid to me in the world-my own. 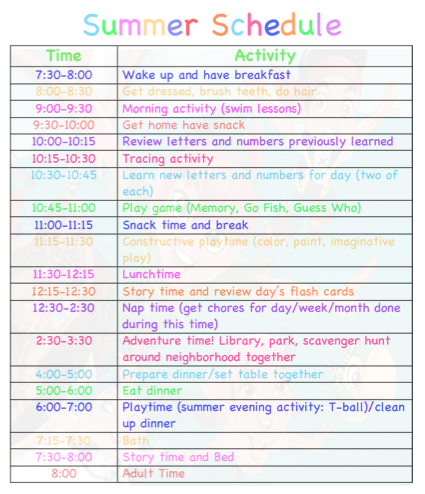 So for all of you other mom's out there who need a schedule to function off of, by all means, take a look at mine for a little inspiration-I was inspired by someone on Pinterest! Hope you have a happy and productive summer!